'Sound and solid case studies on vulnerability and adaptation have been woefully lacking in the international discourse on climate change. This set of books begins to bridge the gap.' Achim Steiner, UN Under-Secretary General and Executive Director of United Nations Environment Programme 'Important reading for students and practitioners alike.' Martin Parry, Co-Chair, Working Group II (Impacts, Adaptation and Vulnerability), Intergovernmental Panel on Climate Change (IPCC) 'Fills an important gap in our understanding … It is policy-relevant and deserves to be widely read.' Richard Klein, Senior Research Fellow, Stockholm Environment Institute (SEI), Sweden The Intergovernmental Panel on Climate Change (IPCC) concluded in its 2001 report that much of the developing world is highly vulnerable to adverse impacts from climate change. But the IPCC also concluded that the vulnerabilities of developing countries are too little studied and too poorly understood to enable determination of adaptation strategies that would be effective at reducing risks. These authoritative volumes, resulting from the work of the Assessments of Impacts and Adaptations to Climate Change (AIACC) project launched by the IPCC in 2002, are the first to provide a comprehensive investigation of the issues at stake. 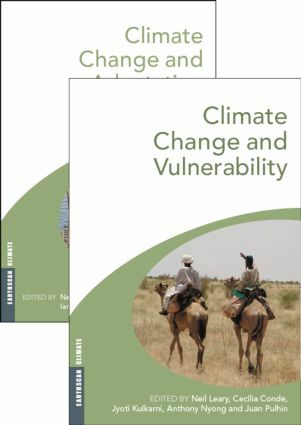 Climate Change and Vulnerability discusses who is vulnerable to climate change, the nature of their vulnerability and the causes of their vulnerability for parts of the world that have been poorly researched until now. Climate Change and Adaptation covers current practices for managing climate risks to food security, water resources, livelihoods, human health and infrastructure, needs for effective management of climate risks, the changing nature of the risks, strategies for adaptation, and the need to integrate these strategies into development planning and resource management.